Pyscho-Pass is a popularly and critically acclaimed cyberpunk anime with two seasons and a film under its belt. The midquel visual novel Psycho-Pass: Mandatory Happiness certainly lives up to all that has come before. Psycho-Pass is set in a dystopian cyberpunk future where a single scan can determine a person’s mental state. This information is known as a “Psycho-Pass.” From this information, the system can calculate your criminal coefficient—a number determining if you are capable of committing criminal acts. Below 100%, you are normal. Above 100%, you are a “latent criminal” to be imprisoned until if and when your criminal coefficient drops below 100%. If you’re above 200%, you’re simply killed on the spot. Because of this system, crime is at an all-time low and the police have been downsized into the Public Safety Bureau’s Criminal Investigation Division. However, to prevent the Inspectors from becoming latent criminals (after all, to catch a criminal you have to think like one), the Inspectors are paired with specially paroled latent criminals called Enforcers who do the dirty work for a small taste of freedom. Set in the first quarter of the first season of the anime, Mandatory Happiness deals with Alpha, a gripping new villain sowing chaos in a man-made island city off the coast of Japan. What makes him such a good villain is how different he is from the two main ones in the TV series. Alpha’s goal is simple: to bring people happiness. However, while a gifted hacker—far beyond any seen in Psycho-Pass before—he is unbelievably innocent. To bring the world happiness, he decides to start on a personal level by finding those on the edge of becoming latent criminals and helping them by giving them their hearts’ desire. Not surprisingly, giving people on the edge of having a mental break exactly what they think they want doesn’t end well—especially when the Public Safety Bureau comes into play. When faced with the bloody aftermath, Alpha can only be confused by our heroes’ actions. The dead obviously aren’t happy. And the possibility that one person’s happiness may negate another’s isn’t seen as a problem to Alpha. After all, he’ll just help the wronged party next and make them happy also. This in turn leads to the theme of the game: What is happiness and what is the best way to make people happy? Foiled again and again in his attempts to bring happiness, Alpha is forced to eventually find new ways to bring it. From medicine to religion, Alpha trawls through human knowledge searching for a way to make the world happy—expanding not only the scope of his operations but his definition of happiness as well. In the story, you play as one of two new characters: Inspector Nadeshiko Kugatachi, a hyper-logical woman suffering from amnesia; or Enforcer Takuma Tsurugi, a man who wears his emotions on his sleeve and is searching for his missing lover. As a visual novel, the gameplay itself is relegated to only a few dozen choices (and an optional puzzle minigame). Most of the game is spent simply watching the story unfold through slightly animated sprites voiced by the anime’s cast. The choices in the game usually pop up more frequently as you near the climax of each of the game’s four chapters. They range from deciding where to go to how to handle a sudden crisis. While these choices rarely end in death, most will get you closer to one character or another from the anime, eventually unlocking a special scene with him or her. However, the main point of the choices is how they affect your chosen character’s psycho-pass (with the game’s most common choice being whether you want to take a mental stabilizer or not). When it comes down to it, your actions don’t really change how the overall story unfolds. The same four cases are an inevitability. What your choices change is your character’s place in the story—and thus what they are able to uncover about the mystery behind Alpha. 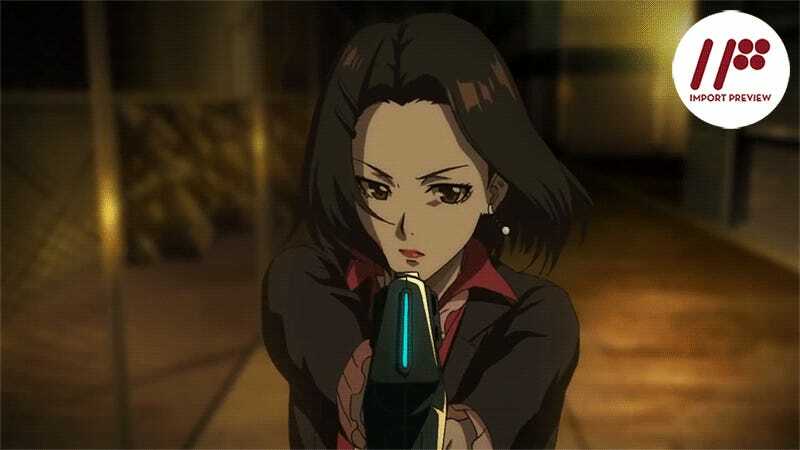 In Nadeshiko’s case, for example, if events go too badly, her psycho-pass can cross the 100% border, making her a latent criminal and limiting her freedom in the process. Another route in the game keeps her stable, making her a by-the-book inspector who is unable to bend the rules when needed. However, the most interesting route comes in walking the fine line between the two—keeping her mentally unstable enough to regain her memories, but not so unstable she becomes a latent criminal. In fact, this route not only delivers all the story’s revelations but also answers one of the anime’s lingering questions (which I won’t get into here because of spoilers). There is one other point that’s worth noting in Mandatory Happiness. Like the first season of the anime and the film, the game comes from the mind of Gen Urobuchi of Madoka Magica and Fate/Zero infamy. To put it another way, this game is quite messed up—so messed up that I wrote an entire spoiler-filled article just talking about my original playthrough of the first two cases. The game will make you do things that are likely to make you want to quit playing/and or make you more than a little psychologically disturbed. Of course, if you’re a fan of the anime, this may be exactly what you were hoping for. Psycho-Pass: Mandatory Happiness is a great missing chapter in the overarching Psycho-Pass narrative. It has a great villain, excellent lore-expanding new characters, and a story that enjoys messing with your mind. If you enjoyed the anime—and don’t mind that Mandatory Happiness is a visual novel—you’re certain to like this game. Psycho-Pass: Mandatory Happiness was released in Japan on Xbox One on May 28, 2015, and on PlayStation 4 and PlayStation Vita on March 24, 2016. It will be released on PlayStation 4, PlayStation Vita, and Steam on September 13, 2016, in the US and on September 16, 2016, in Europe.